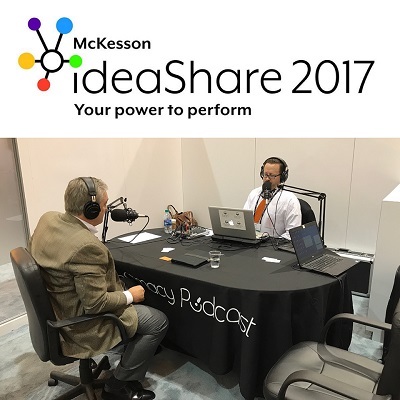 McKesson Pharmacy Technology & Services (MPTS) partnered with the Pharmacy Podcast Network to produce a special Podcast Series during the 2017 McKesson ideaShare in New Orleans, La. This series will include 11 podcast episodes featuring interviews from MPTS customers, as well as thought leadership from industry experts. The third episode in our MPTS Pharmacy Podcast series begins with Jamie Gramz, Vice President, Product Management & Innovation at McKesson Pharmacy Systems. The second half of the podcast features Vic Vercammen, Pharm. D, Vice President, Innovation & Industry Relations at Supplylogix. To listen to the podcast, please click "play" in the podcast player below. Trouble playing the podcast in the viewer above? Please click on the "Listen Now" button below to play the podcast. The eleventh and final episode in our MPTS Pharmacy Podcast series features Ray Zahr, Owner of Ray's Drugs and Vilpesh Patel, Owner of Menard Pharmacy. Like what you've heard? Please complete the form below to have a McKesson representative contact you soon. The tenth episode in our MPTS Pharmacy Podcast series features Nehal Patel, founding member of Wyandotte Drugs and Carolyn Jenkins, Pharmacy Manager at Modern Pharmacy. The ninth episode in our MPTS Pharmacy Podcast series features Paul Fulmer, owner of Fulmer Pharmacy and Mary Gregory, Vice President of Customer Experience at McKesson Pharmacy Systems. The eighth episode in our MPTS Pharmacy Podcast series features Jim Cloud, owner of Ridgeway Pharmacy and Hal Roe, owner of Mountain View Health Mart Pharmacy. The seventh episode in our MPTS Pharmacy Podcast series features Alison Shirley, owner of Scripts Pharmacy and Gary L. Anderson, owner of City Drug pharmacy. The sixth episode in our MPTS Pharmacy Podcast series features Holly Lewis, a 16+ year McKesson veteran who outlines how innovation has kept the independent pharmacy owner competitive. Chris Castagna of Pennington Apothecary Pharmacy delivers a powerful testimony of a 15+ year relationship with McKesson and how McKesson ideaShare will help him bring back several new tools to shape the bright future of his three community pharmacy locations. The fifth episode in our MPTS Pharmacy Podcast series features Sue Longo, Manager of Star Drug Pharmacy in Walsenburg, Co. and Dave Schultz, Owner of Tobins Pharmacy in Oconomowoc, Wi. Longo and Schultz share the importance of political understanding and staying vigilant in the fight to keep community pharmacy thriving, while leveraging innovative technologies to ensure efficiency and greater profitability. The fourth episode in our MPTS Pharmacy Podcast series features Bruce Matte Sr., Owner of Matte's Pharmacy in Monroe, La. Matte speaks with Jamie Gramz, Vice President, Product Management & Innovation at McKesson Pharmacy Systems about the importance of quality customer service. The second episode in our MPTS Pharmacy Podcast series features Adrienne Cervone — pharmacy owner at Beaver Health Mart Pharmacy in Beaver, Pa — sharing some best practices to offer immunizations, clinical services, and improve patient adherence within a community pharmacy. The Pharmacy Podcast Network launched the 12 podcast series with Bernie Reese, Senior Vice-President and General Manager of McKesson Pharmacy Systems. Reese is a pharmacy technology veteran with over 30 years of experience. Trouble playing the podcast in the viewer above? Please click on the "Listen Now" button below to listen to the podcast. Please bookmark this site and come back each week to listen to new episodes of the 11-part podcast series. In the meantime, to learn more about the McKesson Pharmacy Systems division of MPTS, please click on the "learn more" button below. McKesson Pharmacy Systems provides technology and services that help you deliver care to your patients, manage your operations, and gain insight into your data. In addition to three unique pharmacy management systems, we offer adherence and clinical solutions to help minimize DIR fees, manage patient care, and simplify management of patient wellness programs. Our pharmacy technology, software and services all work together to help you take your pharmacy to the next level. © McKesson Pharmacy Systems 2018. All rights reserved.